Home > News - SEPTEMBER 2016 > LIC JEEVAN PRAGATI Automatic Increase in RISK COVER after every 5 years..! 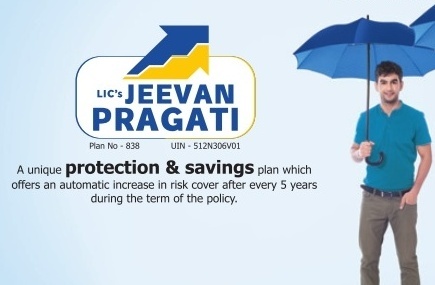 LIC JEEVAN PRAGATI Automatic Increase in RISK COVER after every 5 years..! LIC's Jeevan Pragati Plan is a non-linked, with - profits plan which offers a combination of protection and savings. 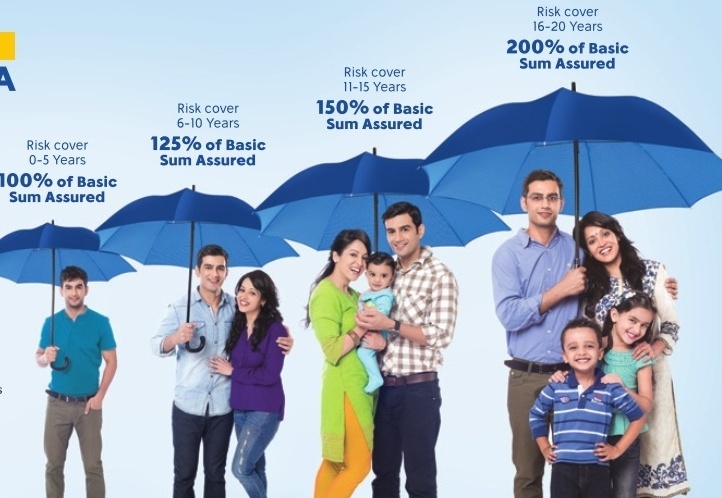 This plan provides for automatic increase in risk cover after every five years during the term of the policy. In addition, this plan also takes care of liquidity needs through loan facility. 1. Death benefit : In case of death during the policy term, provided all due premiums have been paid, Death benefit, defined as sum of "Sum Assured on Death ", vested Simple Reversionary Bonuses and Final Additional bonus, if any, shall be payable. Where "Sum Assured on Death" is defined as the higher of 10 times of annualised premium or Absolute amount assured to be paid on death i.e. 100% of the Basic Sum Assured during first 5 policy years, 125% of the Basic Sum Assured during 6th to 10th policy years, 150% of the Basic Sum Assured during 11th to 15 th policy years and thereafter 200% of the Basic Sum Assured. This death benefit shall not be less than 105% of all the premiums paid as on date of death. Premiums referred above shall not include any taxes, extra amount chargeable under the policy due to underwriting decision and rider premium, if any. The policy shall participate in profits of the Corporation and shall be entitled to receive Simple Reversionary Bonuses declared as per the experience of the Corporation, provided the policy is in force. The Bonuses shall be declared on the Basic Sum Assured. Final Additional Bonus may also be declared under the policy in the year when the policy results into a claim either by death or maturity. The policyholder has an option of availing LIC's Accidental Death and Disability Benefit Rider (UIN: 512B209V01). Rider sum assured cannot exceed the Basic Sum Assured. For more details on the above riders, refer to the rider brochure or contact LIC's nearest Branch Office.